I'm not even sure which of these to work on first but I think I need to stop starting things!! If you find a cure please let me know, I started another two things yesterday! Completely ignoring the wip pile!! hehe! 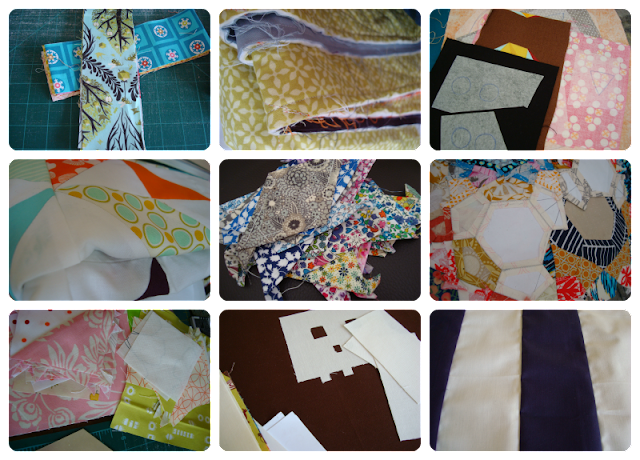 That's a lot of projects and a lot of great fabrics. :) I would say finish the easiest and quickest one first! Yes yes yes! But you are the one starting me, starting things! ...but starting things is so much fun! OMG This made me laugh out loud! literally!!! woops.....you have the 'I can't stop starting things' syndrome.......luckily I don't think it's contagious so we're in no danger while visiting your lovely blog.........what am I saying.......I've had it for years, and there's no cure........lovely fabrics and projects though! So it's not just me then. I love starting. And finishing too, but it's those bits in between. I love that I'm not the only one!! I spent a massive part of last weekend sorting through all my 'stuff' and putting all my projects (in various stages!) into zippy bags. Now all I have to do is work my way through the bags and finish the projects! Oh, and not start anything new - yeah right!!! Pick one - lucky dip - and refuse to let yourself do anything else until you finish it. stop starting?! but why would you ever. =) it's what we quilters do best. ps - I am all out of that fantastic sandi Henderson meadowsweet dot in mint. (middle left photo) I would pay a fortune for any you had to spare. it's my most favorite ever and I can't find it anymore for the life of me. about choked when I saw it! Rest assured, I do not want a cure... But a bit more tidy in my life wouldn't hurt! Hahaha I totally feel you!!! I'm starting to calendar my wips so I can start seeing more of the fruits from the labor rather than constantly treading in the projects themselves! Whichever one is near being complete bust it out! They all look like goodies!! List them all on scraps of paper...put them in a hat and draw one out. Don't stop until you have completed them all one at a time! Boy do I know that feeling. No suggestions, just empathy. Ha ha! I know the feeling too! Pick the one you can finished the quickest..then you will have one less WIP! That would be the binding, wouldn't it?! We are all guilty of it, just do one at a time, but no doubt there'll be another to replace it by the time you finish it, there is with me! Bon courage! Having said that, there is no hurry. Take your time Lucy! Hilarious. I think it's a disease amongst quilters! I am desperate to start something new, but I am resisting! Yeah I know you really meant what to finish, didn't you?! Me, I'm a terrible swearer and would have meant the other wtf. Not surprisingly, I work with children! Hehehe, I'm quite good at keeping it professional at work. Even when I'm really saying wtf! LMAO you and me both sister! I've had such a laugh reading your post and all the responses...great!